It’s been a while since I continued my journey to find the tastiest wonton noodles in the GRVD. It’s not for lack of wanting them. There have been illnesses and work place issues that have sprung up that have made me want these comforting bundles of shrimp and bouncy noodles. However when you crave comfort food, like wonton noodles, I find that my sense of adventure disappears on me. I simply want the best available within a short 15 minute commute and that usually means Congee Noodle House. With my cousin, She Clooney, in town that meant I was doing more family oriented stuff. With She Clooney, my mom and I on an outing we needed something tasty, quick and non-fussy (for my mom’s sake) for lunch. We headed to Congee Noodle King for lunch as it was along the way to our final destination. Congee Noodle King is related to Congee Noodle House and as a result I expected a fairly similar bowl of wonton noodles: traditional and tasty. As usually I went with my regular order of Wonton Noodle with veggie added. For an add on, they gave me a lot of Gai Lan (Chinese Brocoli). I felt very healthy eating all those greens. 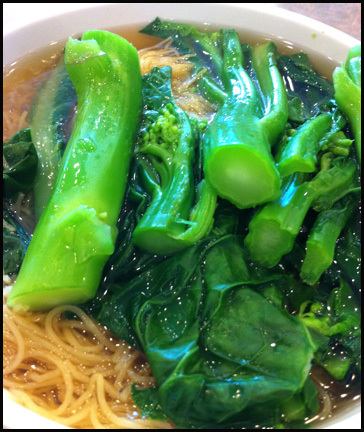 It turns out that Congee Noodle King actually places 2 sprigs of Gai Lan at the bottom of their noodle bowls since my mom and She Clooney found some in their orders. If you only want a few greens, then you don’t have to extra order them like I did. The noodles were bouncy. The soup reminded me of Congee Noodle House’s superior stock but was not as potent and seemed watered down. The soup does get a gold star for not using or sparingly using MSG as I didn’t feel ill or thirsty hours after my meal. 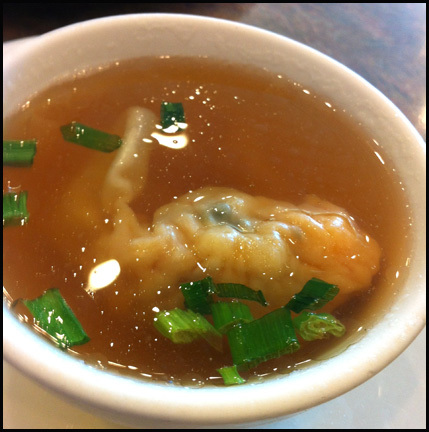 The shrimp in the wonton was not mushy and had a firm texture. However something was a just a little off with how the wontons tasted. They didn’t have that fresh sweet shrimp flavour and tasted a little stale. She Clooney went all in with the protein, ordering the dumpling and wonton noodle soup and then added braised beef brisket as well. When the waitress deliver Clooney’s order, she noted they ran out of dumplings and the kitchen would be making one to complete the order. To be honest, both She Clooney and I agreed that we would not have noticed the missing the dumpling and it was very honest for the staff to tell us that. After 15 minutes passed, a singular dumpling in small bowl was placed on our table. It was kinda of cute. She Clooney had her hands full with what she already had in front of her and as a result kindly offered the dumpling to me. The dumpling confirmed that perhaps the wontons may have been sitting a bit too long. 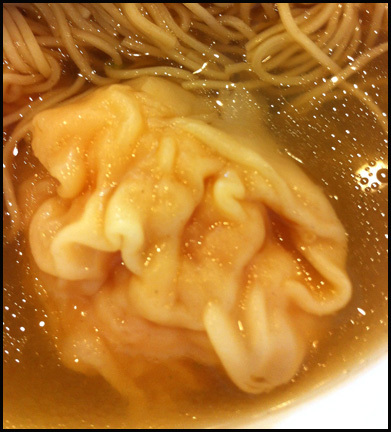 Although the dumpling had additional ingredients (bamboo shoots, wood ear fungus), it has the same base shrimp filling as the wontons. What a huge difference. The shrimp tasted better in the freshly made dumpling. It was sweet, snappy and it didn’t exhibit that stale aftertaste. The bamboo shoots and wood ear fungus gave the dumpling adding texture. This dumpling was a winner. 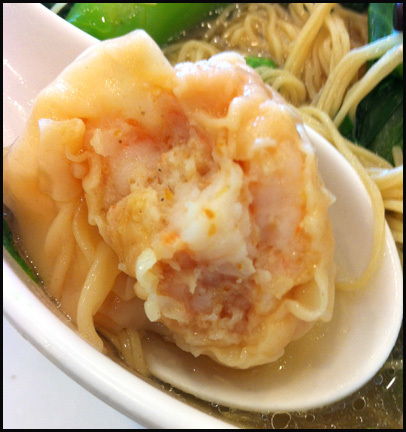 Overall, the wonton noodle soup was underwhelming with the bland soup and wontons that didn’t highlight the flavour of its star ingredient, the shrimp. I much prefer the its sibling Congee Noodle House’s wonton noodle soup. However I’m not writing off Congee Noodle King. I really like that the staff were honest about She Clooney’s missing dumpling, the veggies they automatically include and the delicious dumpling. As a result, I will return perhaps just for the dumplings instead of the wontons in the future and maybe assess if this visit was simply an off day for the wonton noodle at Congee Noodle King.